The baby in the photograph is 12 weeks old and is doing well holding his head up and trying to look in both directions. He is starting to observe his environment. His mother has been giving him tummy time a little at a time since he was born. For safety reasons mothers now put babies down to sleep on their backs following the “back to sleep” campaign of American Academy of Pediatricians in 1985, which was introduced to prevent sudden infant death syndrome. Put baby onto his tummy when he’s awake and you’re there to help. “The position promotes trunk stability, limb coordination, and head control,” explains Henry Shapiro, M.D., medical director of developmental and behavioral pediatrics at All Children’s Hospital, in St. Petersburg, Florida. That’s not all: Spending time on his belly encourages your baby to practice reaching and pivoting, skills that are often the precursors to crawling. Still, some babies hate doing pint-size push-ups and will initially protest when they’re placed facedown. “While on his belly, a baby has to work extra hard against gravity to keep his head up — it’s strenuous,” Dr. Shapiro explains. 1. Start early. Place your baby belly-down on your chest or across your lap for a few minutes so he gets accustomed to the position. Just don’t do it right after a feeding; pressure on his full abdomen may cause him to spit up. 2. 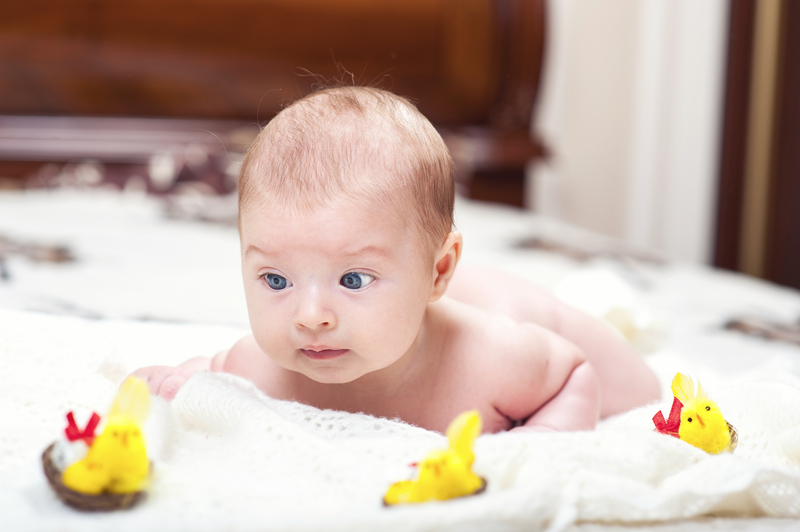 Lay your little one down on a flat, clean surface, such as a blanket or play mat on the floor. If she squirms or cries, try some extra padding. Roll up a small folded blanket or towel and tuck it under her chest. 3. Go head to head. Lie down on the floor and get face-to-face with your infant. Make sounds and expressions, or sing songs. You might feel silly, but your infant will be less likely to fight being on his belly. 4. Give him/her distractions. Hold a mirror in front of your baby to capture her attention. Or place brightly colored toys just within her reach to keep your baby from getting bored. If your baby really objects to tummy time, is not able to turn his head both ways or seems to lie with his head crooked, he could have a problem at the top of the neck. If you would like to have your baby’s spine checked by an experienced chiropractor, give us a call and book an appointment on 043481166.